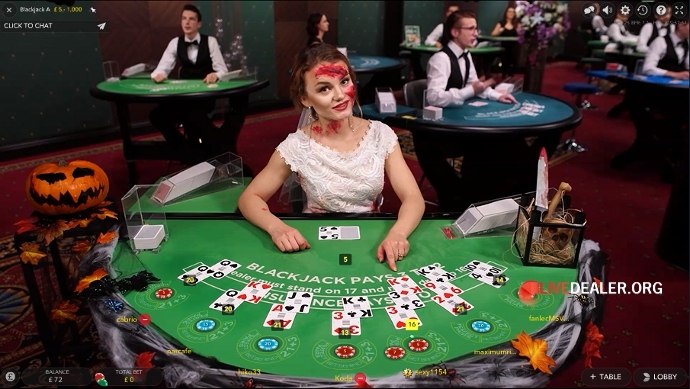 Live dealer casino shocks, surprises and frightful tables from the month of October. If you missed the 2017 Halloween promotions, you may think there’s little point going into much detail now that they are over, in which case feel free to leapfrog ahead. 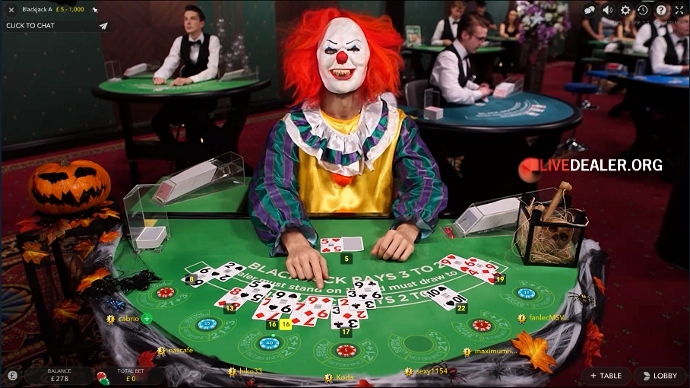 But I’m always minded to give players an eye of newt, and toe of frog, wool of bat, and tongue of dog….., flavour of how actively engaged the live casinos are at promotion times. This year once again there were plenty of dealers in costume, some marvellous, plus the expected table decorations. 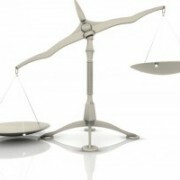 Although this time the big platforms tended to focus on specific tables, rather than spread thinly across many tables. Playtech particularly, unlike my many previous years playing at their tables (too many to count on a skeleton’s hand) didn’t have any trimmings at the Euro studio generic tables and limited their efforts to a Halloween roulette table. 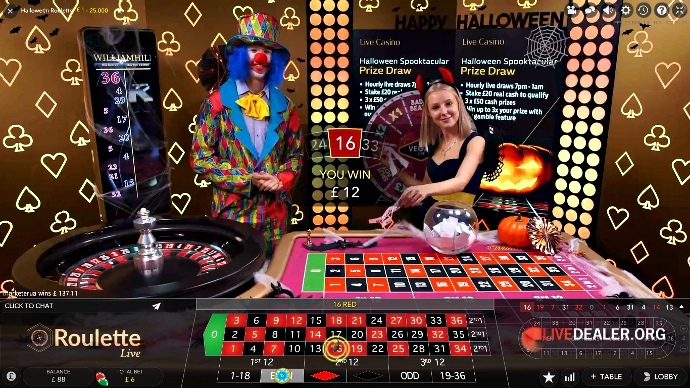 The special Halloween Fortune table making best use of the technology now in place at the dealer studio in a similar fashion to the live experience Age of the Gods roulette table and similarly promoting a specific RNG slot game from Playtech. Dealers working the table came well prepared with lots of Halloween bewitching talk. Simple details like the potion bottle winning number table marker (when the dealer remembered to use it) more often appeal to me, rather than seeing dealers frantically waving their arms aloft like a bat learning to fly combined with dealer fed spiel. A quick virtual broomstick ride over to the Asia studio revealed a greater crop of pumpkins spread across generic tables, which for the most part are still using the old style playing interfaces. One Emperor Room dealer seem a wee bit perturbed about her table companion. 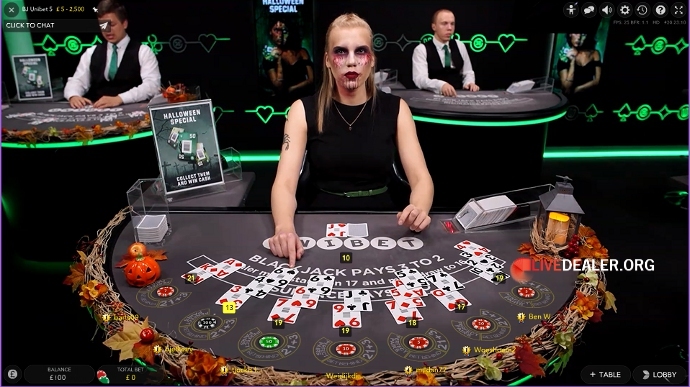 The recently installed bet365 Dragon baccarat table was pumpkinfied unlike the bet365 tables back over in the new Riga Euro Studio. Of the remaining Euro private table areas at Playtech, some did come with a smattering of spiders, hats, pumpkins and the like. 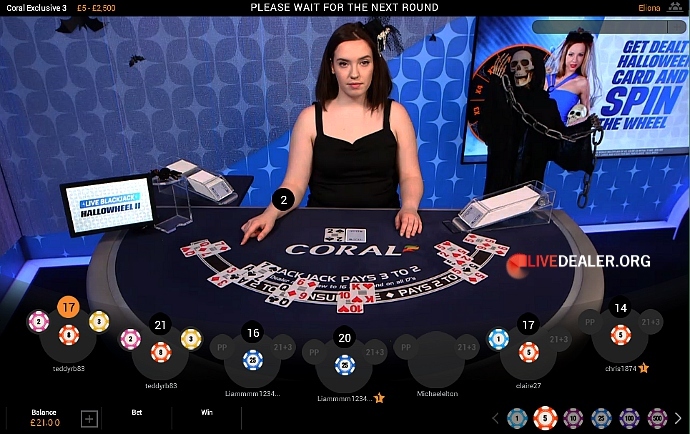 More specifically Coral, who’s dealers cast aside their nice blue dealer dresses to wear the more terrifying old generic black dresses :o.
Ladbrokes were also pushing the terrifying quota to the max with the old dresses and novelty pumpkins. 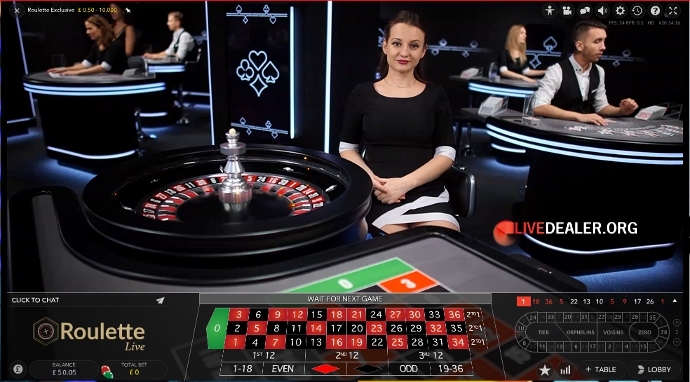 The much shorter broomstick ride over to Evolution Gaming live tables in Riga revealed a few surprises and a major triumph, more on that bellow. 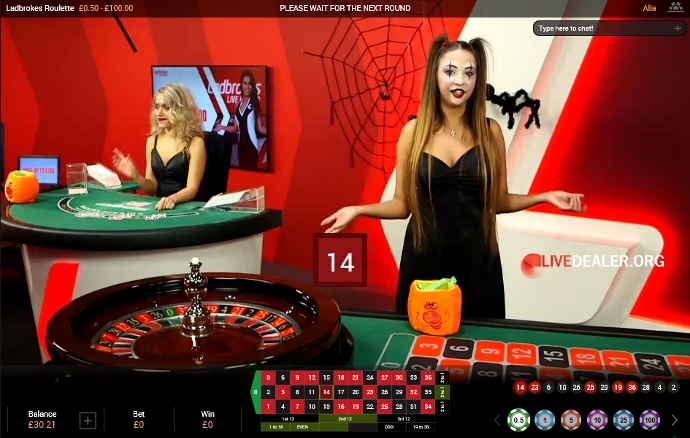 Compared with other years, William Hill downplayed Halloween with only the spare undead Vegas roulette table called back into action as Halloween Roulette. No bonus points for original name William Hill, but the hourly prize draws leading up to the 31st were good and the dealers got nicely into character. 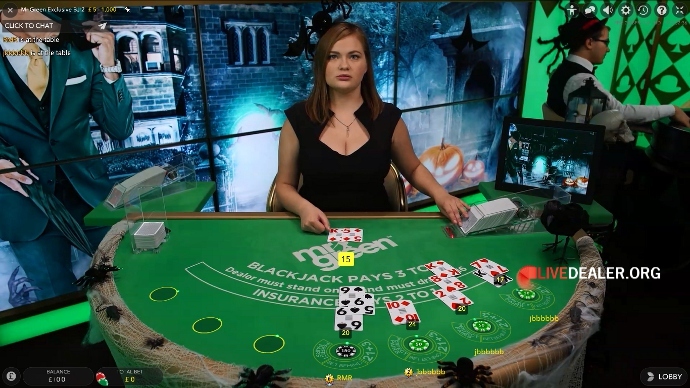 Halloween was likewise scaled back from previous years at 888 casino, almost like an afterthought that they woke up from a slumber spell on the day and thought they ought to do something. 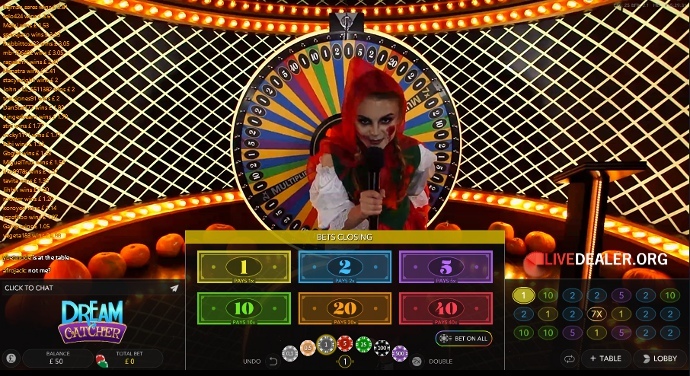 Perhaps the odd frugal table decorations were a sign of cost saving after being hit with the recent £7.8million fine :P.
and Mr Green who made best use of their video wall backdrop featuring a haunted house. Not for the first time PokerStars’ private table area was one of my favourite looking, if only because of the recurring ghostly wall photos (pictured below). 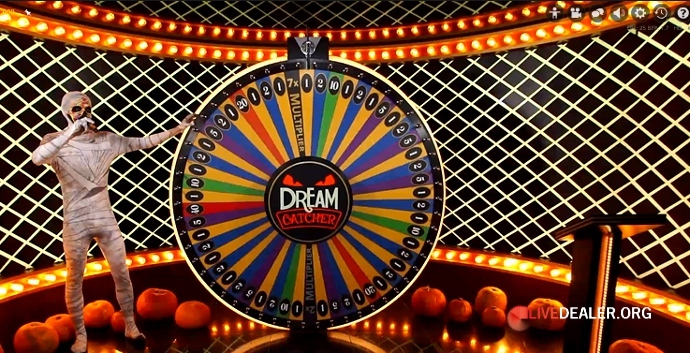 But, of all the dealer Halloween spectacle, or lack of, on show at Evolution nothing compared to the pièce de résistance Dream Catcher. As anyone (pity the poor tormented souls) who has read my numerous casino ramblings will know, I mostly dislike and avoid tables populated with noisy, cocky presenters/dealers who are on an inflated ego trip because they have been tasked with being “entertaining” by the studio. 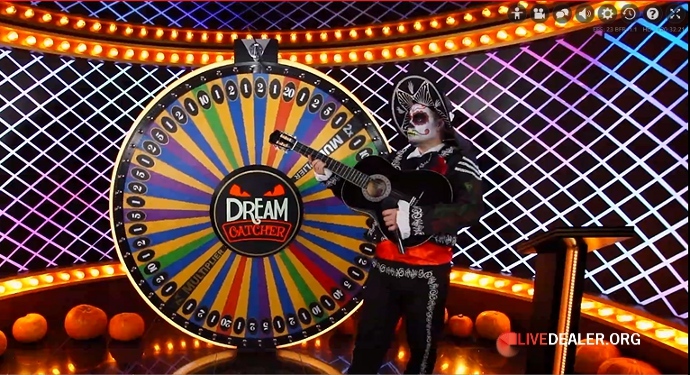 Nevertheless I couldn’t help but be so impressed by the variety of Halloween costumes on display at Evolution’s Dream Catcher Money Wheel. 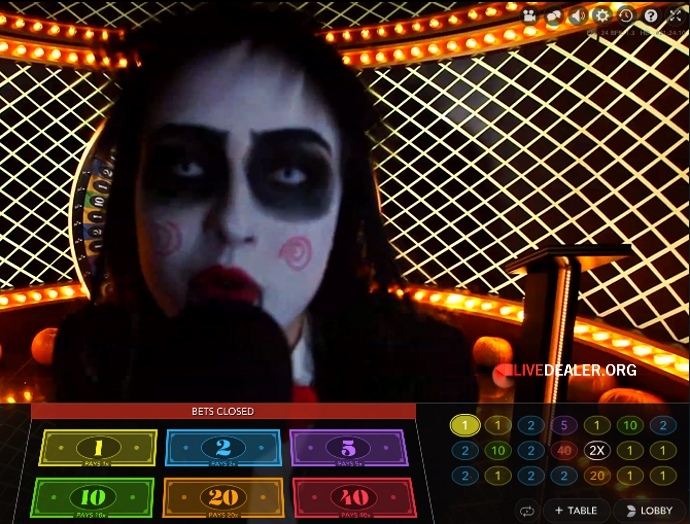 The game presenters/dealers went deep into their corpse, witches, Joker,…, personas with talk of being dead for hundreds of years, casting a spell on players, murder, wishing no players to win and so on without it feeling scripted. Background music, another usual major Fester bugbear, for once added to the ambience. Lighting changes on the game multiplier rounds made good use of the pumpkins. Another of those simple small details that so often appeal to me were the eyes on the wheel logo. It really was an enchanting spectacle to behold. A big congratulations to Evolution for raising a smile on a festering casino corpse like mine. 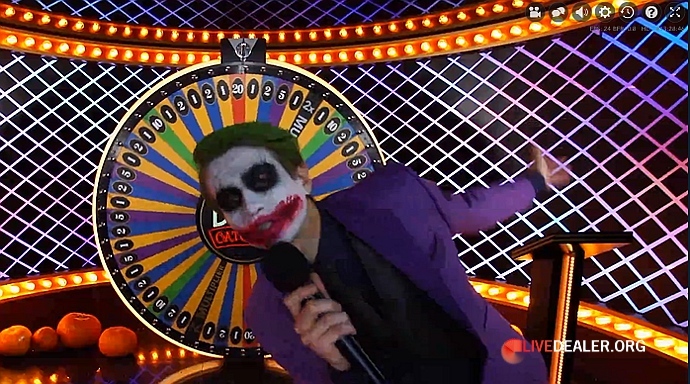 When the game presenters weren’t spinning the wheel or doubling up on the wheel, they remained in full costume dealing on a generic blackjack table. Much to the delight of players, even when the dealers couldn’t see the cards. 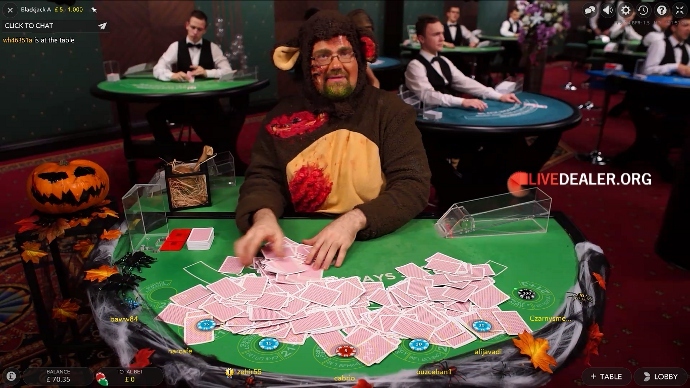 New to Evolution blackjack players, never playing at Dream Catcher may have thought it slightly surreal when a large wounded teddy started throwing cards around the table, even though he was of course just chemmy shuffling. Nothing lasts forever as they say, but this was quick. 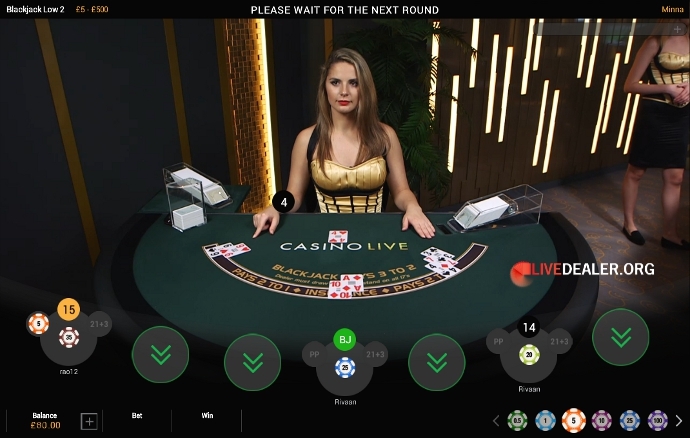 Having only just opened new private table areas at Playtech Paddy Power and Betfair joined their efforts to open a new replacement bling set of shared private exclusive tables. Two questions immediately sprung to mind. Firstly, why did they bother with the new private areas that only opened as recently as June. 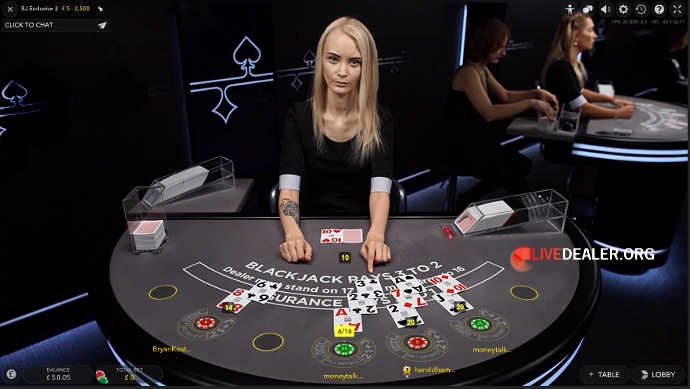 Obviously Playtech were in the process of transferring private tables from the old Riga Studio to the new studio, but couldn’t Paddy Power Betfair Plc tables have remained until the new shared exclusive table area was opened?. Perchance it was a later decision, after all it wouldn’t be the first time private tables belonging to Betfair have come and gone in the blink of an eye at Playtech…..anybody else remember the grey walled scrapped Asian dealer tables in Riga?. That or it was always the plan to open a shared area and the branded casino tables will remain, if only accessible for private booking, promotions and so on. Whatever the case I won’t miss the 2017 Paddy Power private tables….tongue in cheek I might be tempted to say early feedback from the new look might have shortened the tables lifespan. But I did like the Betfair reboot (call it what you like) upgrade and new uniform. Talk of which leads to my second question. Exactly how much have they copied from William Hill’s uniform? Other than a slight difference in colour which in part might be ascribed to lighting, and the extra black detail on the dealer’s corsets they look pretty much identical. I found it especially amusing on seeing the new uniforms as I’ve had past conservations with Playtech dealers along the lines of how despite not liking their black dresses they were glad they didn’t have a uniform like Will Hill. Uniform copyright issues aside, the consensus from players despite the relative darkness seems to be a positive thumbs up for the new area. Another question just sprung to mind….will the dealers ever be allowed/instructed to wear the corsets strapless, a common sight at William Hill. I’m sure there are players who’d like to see Playtech dealers bare shoulder ;). 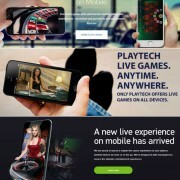 The supply of new and “different” baccarat tables shows no sign of abating anytime soon at the major platforms with the opening of extra table(s) at Playtech in October. The new table, labelled as “table 1” suggesting the potential for more to be made available (or in the pipeline), is nice enough to look at but certainly no more gold in feel than the Grand Royale/Liberace table area and there are already several nice looking Asian tables, including the Squeeze Baccarat table albeit that comes with the irksome time consuming card reveal. I mention card reveal because there is a difference with the card deal on Golden Baccarat, although as LD highlighted it makes no difference to the actual game result as with all the other baccarat tables. 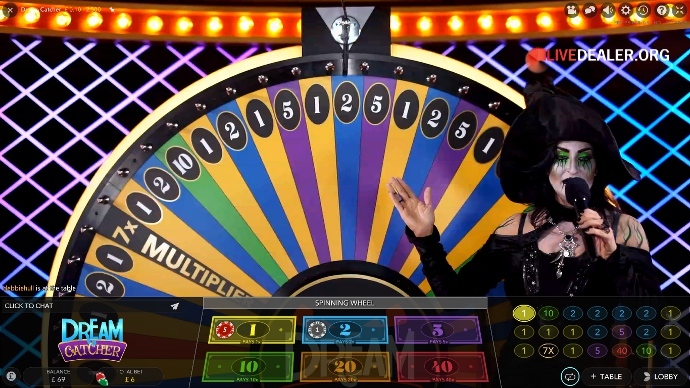 All the cards needed (6 in total including the potential extra cards according to 3rd card rules) for the game round are dealt face down during the betting time. From my viewpoint, with no superstitions and the like, the main benefit of a deal like this is to appease player doubts about game integrity. 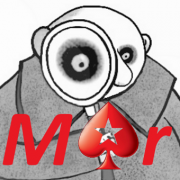 Any regular player at live dealer tables will surely have come across paranoid delusional players who accuse the casinos of cheating somehow, of always monitoring (and reacting) to players bets and so on. 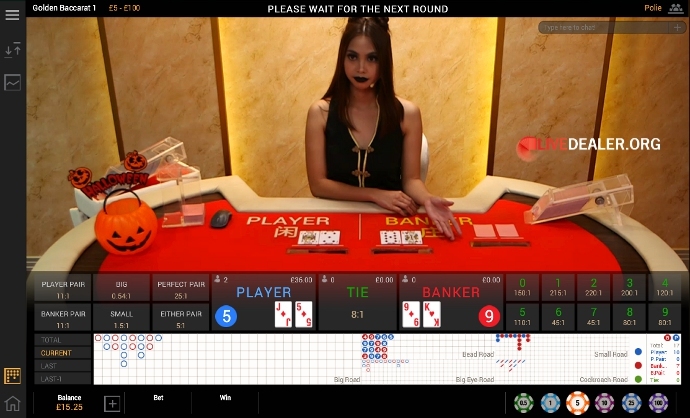 By already having the 3rd card on the table perhaps the idea is to convince players that no slight of hand card tricks is occurring so as to deliver a game result most favourable to the casino with the least number of players winning?. From my experiences of banging my head against a wall, some players of that mind will never be convinced of no wrongdoing and they simply shouldn’t be gambling online let alone ever going anywhere near RNG games. 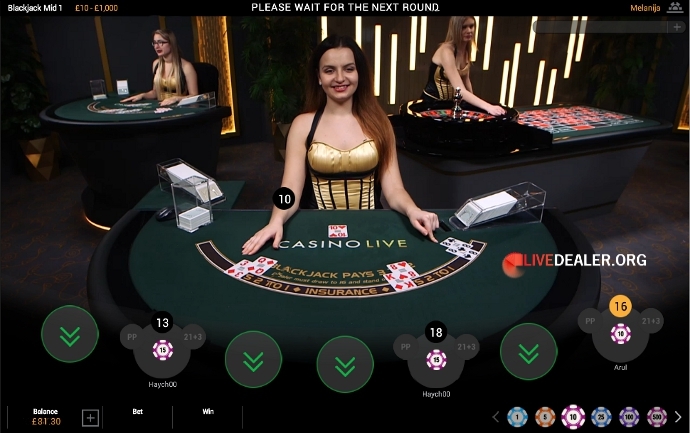 Whatever argument you put forward to them, they always fall back on the old chestnut of the slight delay of live dealer games between live and delivery to your screen. 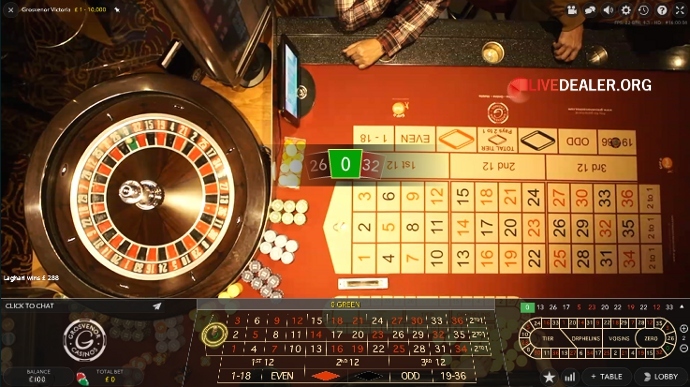 As LD pointed out writing of the Paddy-Betfair (combo) tables, group casinos combining tables into a shared “exclusive” private area is an emerging trend from 2017. Large impressive examples of these shared areas already existing at Evolution include the distinct looking Clubhouse (a personal favourite) and Betsson Group exclusive tables. tables at Evolution. Currently 1 roulette and several (7 including VIP) blackjack tables makeup the area. 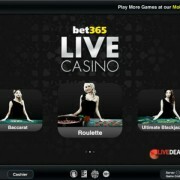 The tables are accessible to Kindred Group casinos of which Unibet is undoubtedly the most well known. Other brands in the Kindred Group include 32Red, Maria Casino and Stan James. One Exclusive dealer in particular gave us here at Livedealer.org the heebie-jeebies without the need for any Halloween makeover. Happily I can confirm she’s not so frightening to play and talk with :). In other related news from October the Kindred Group announced the Stan James brand was to be phased out in the UK as it migrates customers to Unibet. Kindred chief executive Henrik Tjärnström said in an interview with the Racing Post the plan is to shut down Stan James in order to concentrate its UK market activity through group flagship brand Unibet. All Stan James related marketing and sponsorship activities will be taken over by Unibet, including replacing Stan James as the title sponsor of The Champion Hurdle at Cheltenham. 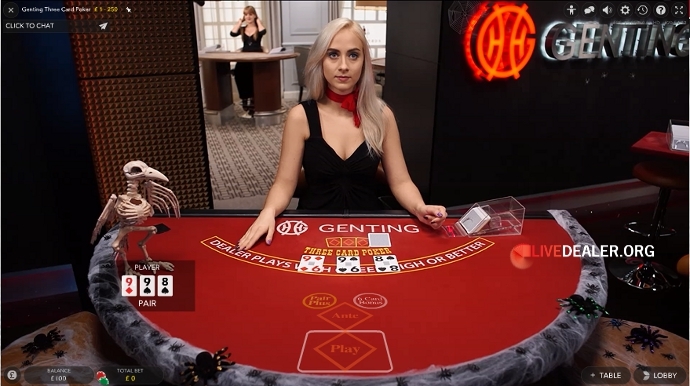 Hot on the heels of Genting’s Dual Play roulette table that opened in September, Grosvenor Casinos launched their own Dual Play table in October. 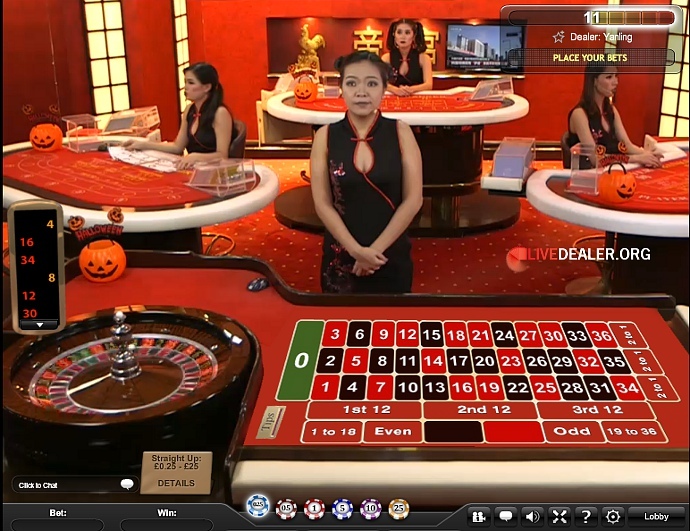 The latest new Evolution powered in-casino roulette table is streamed from Grosvenor’s Victoria Casino in London. 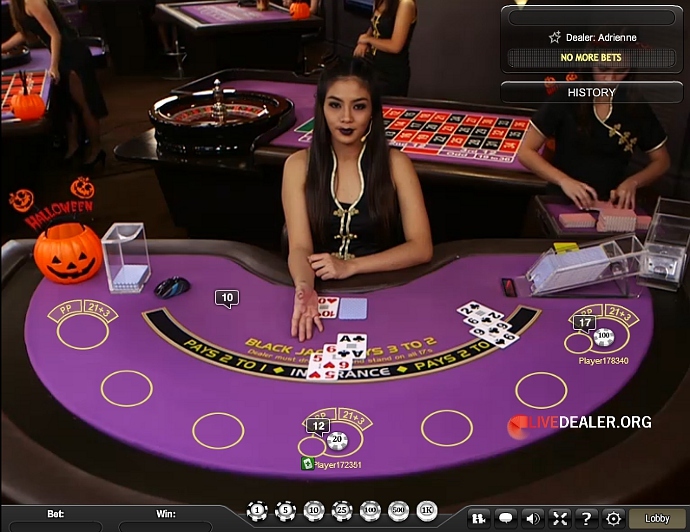 As with previous Dual Play tables all the action is captured thanks to the HD multi-camera setup. Truth be told, there’s not much to distinguish it from other Dual Play tables except some differences in camera angle but if ain’t broke, don’t fix it. 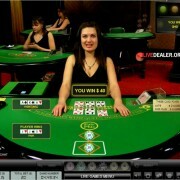 Naturally the one fundamental difference being, you need to playing at Grosvenor Casinos to have access to the table. If you can access the table, which is conveniently open 24 hours a day I recommend you give it a try for a feel of something different from the regular studio tables. 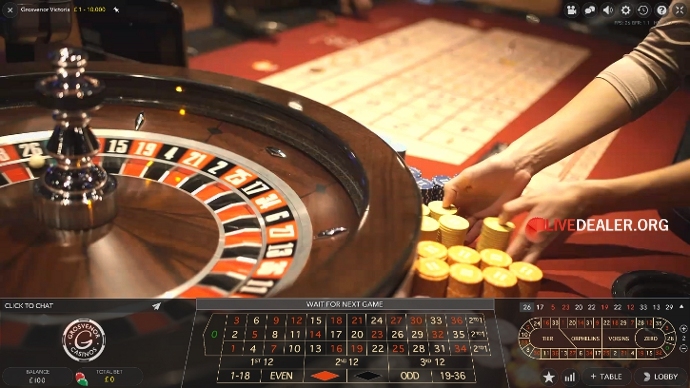 All these in-casino tables from the likes of Evolution and Authentic Gaming still leaves me questioning just how long it will be before Playtech announce their own non geo-restricted table for general access play ;). 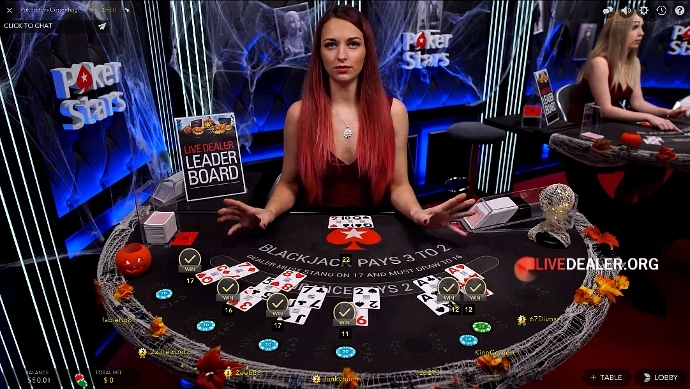 Never one to stop expanding, several more star tables, of the PokerStars variety have lit up the live dealer casino landscape. The latest PokerStars private blackjack tables at Evolution take the current table tally to the dizzy heights of 23 private tables. Such a figure a few years ago would have been unthinkable, and more tables than all but the biggest European studio had to offer in total. 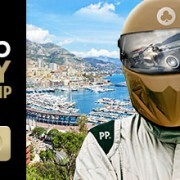 The newest “stars” go by the name of Atlantic City, Copenhagen, Manilla (yes that spelling), Marbella and Stockholm…just as well there are so many cities in the world with names to choose from with the way PokerStars is going I say!.